Alarmed by allegations that Wells Fargo retaliated against whistleblowers, the Labor Department set up a dedicated website last year for the bank's workers to report abuse and seek advice. Earlier this month, the website disappeared -- and Senator Elizabeth Warren is demanding to know why. Warren fired off a letter to the Labor Department on Thursday raising concern over the removal of the Wells Fargo website. She cited the "substantial harm done to workers" as a result of "widespread and continuing" management problems at the scandal-ridden bank. The Democrat from Massachusetts said the website -- www.dol.gov/wellsfargo -- was "up and running" as of January 20, the day Trump was sworn in. However, Stephen Barr, a Labor Department spokesman, told CNNMoney that the Wells Fargo page was taken down on January 9 while President Obama was still in office. Barr, a four-year Labor Department veteran who called himself a "career civil servant," said he does not know why the page was removed nor whether it will go back up. 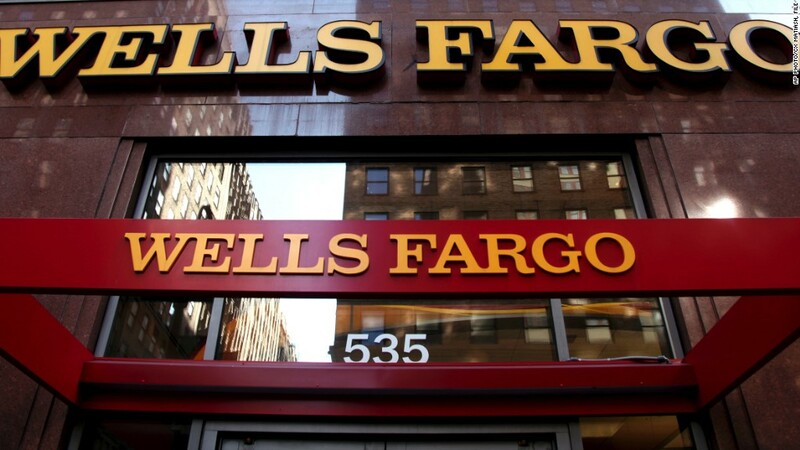 "The current administration has given no direction whatsoever here at the Department of Labor on anything regarding Wells Fargo," Barr said. A search on the Internet Archive, a nonprofit digital library of archived web pages, shows that the page was available on December 21. However, the archive doesn't indicate precisely when the page was taken down. Warren's office did not respond to questions over the discrepancy about when the site was removed. Wells Fargo was unaware that the website had been taken down, a person familiar with the matter told CNNMoney. Wells Fargo declined to comment on the matter. Click here to read an archived version of the page. Wells Fargo's fake account scandal -- the bank fired 5,300 workers for creating as many as 2 million fake accounts -- has revealed a toxic sales culture and allegations it mistreated workers. 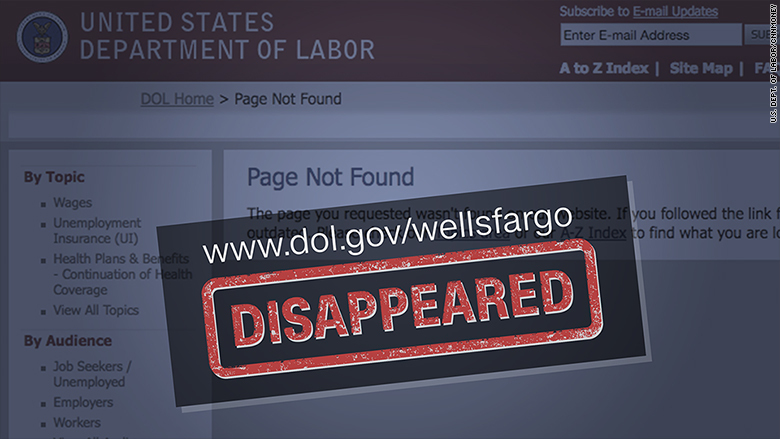 The Labor Department launched the website last September as a way for Wells Fargo workers to flag potential violations and learn about their rights. "Taking down this website enables Wells Fargo to escape full responsibility for its fraudulent actions and the Department to shirk its outstanding obligations to American workers," Warren wrote. In addition to launching the site, the Labor Department under former President Obama opened a "top-to-bottom review" of Wells Fargo cases, complaints and violations. That review included an inquiry into both open and closed whistleblower complaints against Wells Fargo. The Labor Department's focus on Wells Fargo followed a CNNMoney investigation on former employees who said they were fired after trying to put a stop to illegal practices by calling the bank's ethics hotline. Wells Fargo (WFC) recently admitted that a review of its ethics hotline has uncovered evidence that at least some of these whistleblower retaliation claims may have merit. A spokeswoman for the bank emphasized that "there is no place for retaliation at Wells Fargo." The Labor Department was also investigating claims from hourly Wells Fargo workers who said the bank's pressure-cooker culture forced them to work late without overtime pay. CNNMoney spoke to numerous former Wells Fargo employees who alleged wage theft. Wells Fargo has said that its employees are compensated for all hours worked, including overtime. Warren wrote that she hopes the Labor Department "under President Trump" will make sure Wells Fargo workers cheated out of wages or illegally retaliated against will be provided "all of the remedies available" under current law. The letter from Warren asked Labor Department officials to respond to several questions by February 3, including whether the agency will reinstate the Wells Fargo website and if the investigation will continue despite the transition of power. There are signs that the investigation may have hit some recent obstacles. In mid-December, the Labor Department wrote a letter saying that an outside attorney representing Wells Fargo tried to hamper the investigation, The Wall Street Journal reported. The letter said that in addition to denying access to records and interviews, the lawyer said she could be part of the new Trump administration, the Journal reported. Warren asked the Labor Department to expand its investigation to look into how Wells Fargo employees told The Wall Street Journal that a 24-hour heads up ahead of internal branch investigations gave them time to shred paperwork and forge documents.